Written on May 23, 2011 by Kevin. There are some toys that stand the test of time and Mega Bloks are one of those. They continue to adapt to the new generations and their latest creation is the Dora the Explorer line of products. TeamMom provided me the opportunity of checking out the Mega Bloks Dora's Garden Gazebo. As expected my daughter took to this toy quickly. This one is rated at 3+ years so she fits it nicely. These Mega Bloks sets allow for building and rebuilding with years of entertainment. Each set also includes a Dora characters with Build & Dress accessories. This is definitely a winner in my daughter's eyes. She has already asked for additional sets for her upcoming birthday. 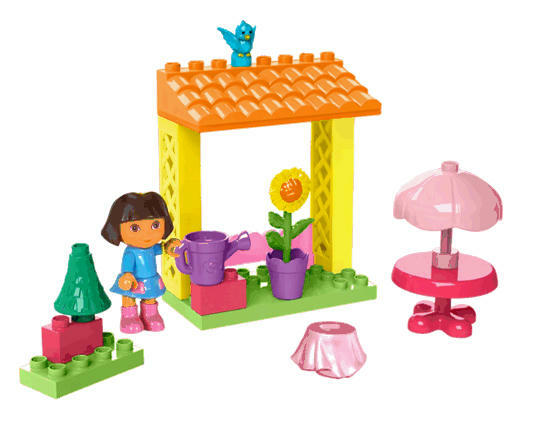 The Mega Bloks Dora the Explorer Garden Gazebo retail for about $14.99 at retailers such as KMart, Target, WalMart or online at Amazon.com. I would recommended checking out the Mega Bloks Family Club for a $5 Mega Bloks coupon, fun activities, and more.